Ruben Sierra did not huff his own bat. He only huffed glue. He did not wear a badge bigger than his head. Few things were bigger than his head. He did not play in Arizona, the only U.S. state with saguaros. He was not the star of "Dune." He just wished he was. Smoke from the things he burned did not turn into clouds. Usually. His pants did not have more wrinkles than Betty White's face. 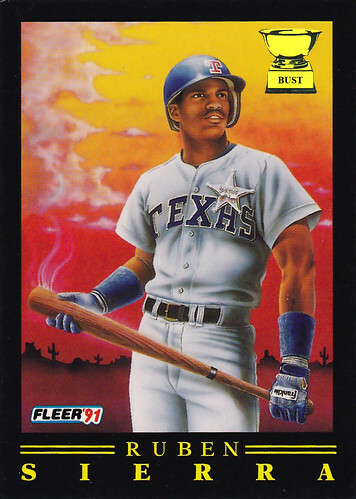 I, as well as every other kid on my block, bought copious amounts of Fleer rack packs the summer of '91 for these Pro Visions, despite the heinous yellow design of the base card. I still like them, though this Ruben isn't the best example.